Fitness has become a huge seller in recent years. A quick glimpse at your Instagram feed and every third person out there is trying to make a living posting their latest regimes, workouts, guides, and numerous other videos, as well as an inordinate number of selfies. While I wouldn’t go as far as to call myself anything of a fitness guru, I do enjoy physical activity, which includes playing football, hitting the gym, and the occasional run or two every week. As such, my fitness band is crucial to keeping track of my daily performance, weekly objectives, as well as medical benefits such as rewards and premium reductions. Being the proud owner of a Fitbit Charge 2 currently, as well as a number of previous fitness trackers, I welcomed the opportunity to review the Fitbit Ionic when it was presented. The Ionic is Fitbit’s first official smartwatch. While it may have flirted with the title on the previously released Blaze, the Ionic is the company’s first to receive the moniker. The inclusion of this simple title now means that it competes directly against a new set of competition, which includes the Apple Watch and a host of Android Wear smartwatches. The Fitbit Ionic looks very similar to the Blaze, with only subtle differences here and there. There’s a huge distinction, however, between these two devices and the rest of the product lines. Both the Ionic and Blaze aren’t the most elegant looking designs, and won’t be able to turn heads as much as the Apple Watch, Huawei Watch, Samsung Gear S3, or Moto 360, some of the best-looking smartwatches available today. That said, the design does have a sporty look and feel to it, featuring a heavy rubberised band, which is relatively lightweight. The watch is also very streamlined, with the body thinner than most other smartwatches. Fitbit made use of a nano-moulding technology to squeeze in the antennae and sensors into the compact body and keeping the bulk down. In addition to the compact frame as a result of the use of this technology, the unit also provides water resistance to allow being able to use to keep track of your swimming exercises. This light and sleek build make for comfortable use during physical activity, a huge plus for any fitness fanatic. The unit features a 1.42″ Gorilla Glass screen, which produces roughly 1000 nits of brightness. With a resolution of 348x250px, the Ionic is one of the clearest and colourful screens available. The touchscreen capabilities are also quite crisp and smooth to touch. The screen is quite sensitive to touch, which leads it to pick up a swipe and a tap, and vice versa. After a few days usage, you’ll become more familiar with the sensitivity, allowing for much easier touches as a result. In conjunction with the touchscreen interface, users can also make use of the three buttons to interact with the device, with the main menu button on the left, and the two ‘shortcut’ buttons on the right. 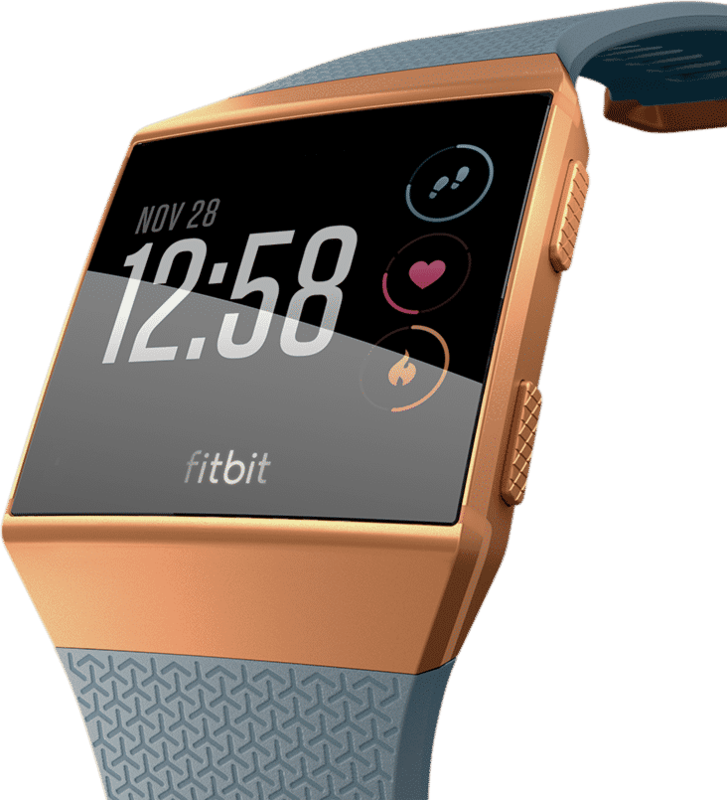 The Fitbit Ionic is available in three colours, which include a silver grey body with the classic blue-grey band, smoke grey body with the charcoal band, and burnt orange body with the slate blue band. On many of the previously released Fitbit devices, the colour of choice has been the black band. It’s strange then that the Ionic wouldn’t feature this prominent colour option, although the charcoal band isn’t too far off from black. The Fitbit Ionic is available only as one body option but includes two sizes of bands in the contents for users of different wrist sizes. This makes it an easier purchase than the other fitness bands for which you’ll have to choose the size specific to your preference. The bands are extremely easy to switch out, with a simple click to release and sliding back to fit in place. There are a few strap options to choose from such as a sports or classic leather bands, available via Fitbit and various other third-party stores. Also included in the contents are the charging cable and manual. The charging port has a magnetic head, which allows you to easily click it in place, and while it doesn’t offer a clamping system as many others, you wouldn’t have to worry it will fall out of place while charging. The straps themselves are very comfortable and easy to use. The rubberised material makes it quite grippy, so you don’t have to strap it in too tight for it to remain in place, and you don’t have to tighten during physical activity either. This means that you’re able to track your steps and heart-rate without any issues whether you’re asleep, running, and even swimming. With so many varieties of straps these days, with each OEM trying to outsmart the next, I’m pleased that the Ionic features a simple buckle strap, which also clicks into place once you’ve allocated the hole for your buckle to keep it locked down. The strap is a bit thicker than that of the Charge 2 but fits in well with most other watches. When it comes to the number of features at your disposal, the Ionic won’t let you down. The unit packs in all the basic requirements fitness buffs would require, as well as one or two additions that you may find useful. In terms of the sensors packed in, it includes a fully-functional, built-in GPS, an accelerometer, a heart-rate monitor (HRM for sanity purposes) and an altimeter to keep track of your hill climbs and the likes. 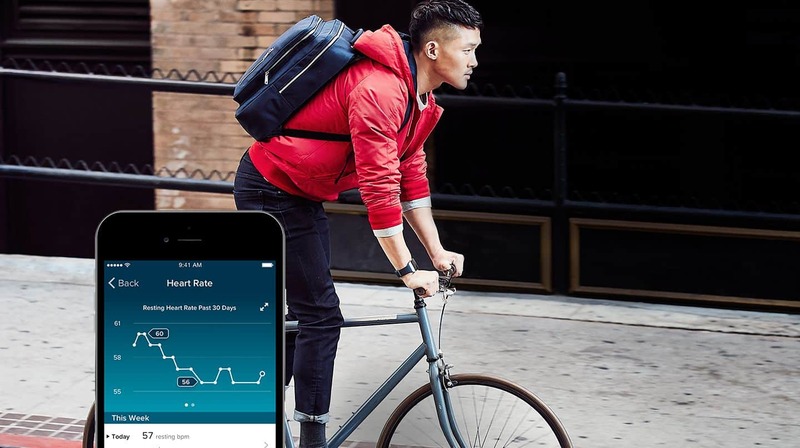 Fitbit has also included a relative SpO2 sensor, which can be used to detect oxygen levels in your blood. The sensor isn’t yet fully operational as yet, but there is quite a number of useful features that could be derived from its inclusion – for starters, better tracking of sleep disorders such as apnoea. This would be quite a brilliant and cost-effective method of monitoring such complications, which often requires a number of days in a sleep clinic to provide results, often times at excessive costs. In terms of the more basic features, the Fitbit Ionic tracks your steps, distance, calories burned, heart rate, floors climbed, active minutes, as well as your sleep tracking. Thanks to the UI customisation, users can choose which of this information is relevant to your daily tracking requirements. You can also setup other useful information trackers, such as step reminders to perform at least 250 steps per hour across your choice of hours active. While Fitbit has included the HRM on a number of its devices, the Ionic has an improved PurePulse monitor for better tracking. Fitbit also suggests the HRM provides better results due to better contact with your skin and a more stable point of contact, which is particularly useful when working up a sweat during physical activity. One of the features I find most useful is the sleep tracking capabilities, and the Ionic does a good job of it. Once the SpO2 monitor is active, I can only imagine the information provided will be of even more value than the levels of sleep it currently provides. These levels are broken down into Light, Deep or REM stages, as well as the amount of time you’re actually awake overnight without realising it. It’s a surprisingly frequent occurrence, which scientist claim it to be quite normal, although you’re not awake long enough to create any memory of the events. While I do run relatively often, I don’t find myself one to care about tracking where I run, since I basically follow the same route all the time. This means that I wouldn’t be the target audience for tracking my runs using the built-in GPS. That said, there are numerous runners out there who enjoy mixing it up and it provides a good tracker, as well as additional and more accurate information for the distance travelled. Further improving on this, Fitbit makes use of the standard GPS satellites, as well as the Russian Glonass satellites to provide near-accurate results. The most improved feature, however, is the water resistance. While this may seem trivial, Fitbit has pushed their standard resistance beyond the point of protection against rain, sweat and random splashes, to actually suggesting you use the device to go swimming, even at depths of 50m. The updated sports tracking also allows for tracking your swim routine including tracking your laps; a previously sore point for swimmers. As mentioned previously, users can operate the Ionic by means of the added buttons, and not just the touch interface. This is useful when submerged in water, as you wouldn’t be able to use the touchscreen. You also no longer have to remove the device while taking a shower, although I do still prefer to remove it, just to allow my skin to breathe a little after washing. The Fitbit Ionic includes guided workouts feature. This is broken down into two sections, those preloaded onto the device, and those that come via the Fitbit Coach app. This app is actually a rebrand of the Fitstar Personal Trainer app, which offers more than 40 different workouts. You can follow the on-screen instruction for interval training or audio-based coaching via the Bluetooth capabilities. The Bluetooth allows users to connect their device to their wireless earphones or headphones. These workouts also include motivation while you’re running, etc. There are also seven Fitbit radio stations, although I don’t think these are available in South Africa. Other guides provide a mix of 7 to 60 minutes workout sessions, through various exercises including push-ups, high knees, jumping jacks, planks, and much more. Being a ‘smartwatch’ it’s a bit strange that the device doesn’t include the option to have an always-on screen, as most others in the category. The device does have an automatic turn-on screen whenever you flick your wrist in the direction of your eyes. The issue is that it isn’t always as fluid as I just described, which either prompts a double flick or having to click the menu button. This is particularly frustrating when you’re in the middle of any activity and you’re unable to check your heart rate, or distance and the likes. Still, this isn’t a big turn off. Despite its thinner and lighter frame than the Apple Watch 3, the Ionic has a much better battery life, more than double. The former has an expected battery life around 18-20 hours, while the latter is closer to 5 days. This, however, does vary depending on the type of fitness tracking you’re performing. During my first few days of use, I was able to easily make it through the promised 5 days, while also being able to track my gym and football routines. When tracking your runs via the built-in GPS tracking, the expected battery life is cut to 2 to 3 days depending on the duration. The unit has a 10-hour battery life with GPS tracking, enough to make it through a marathon if you’re in good shape. Given its newly found status as a smartwatch, the Fitbit Ionic has a list of third-party apps that can be installed on the device. This is where the Ionic would be set to make quite a big difference amongst other fitness trackers. Unfortunately, this is also where the Fitbit Ionic comes undone. There aren’t nearly as many apps as you’ll find available on the Apple Watch or Android Gear smartwatches. The community of developers is steadily growing, but not at the rapid rate it was expected to. The device also includes 2.5GB of internal storage, which allows you to store around 300 songs you can use to listen to directly from the device without needing to play through your smartphone. Simply connect the device’s Bluetooth to your wireless headphones, and you’re good to go. Well, almost. There’s still the not-so-simple task of connecting the device to your PC and then also copying the files, both of which are procedures on their own, so much so that there’s a dedicated section in the official Fitbit forums to addressing this. Once that’s done, however, you’ll have no difficulties in playing your music. There are also more advanced notifications that the standard messages on the Fitbit Charge and the likes, although not as fully interactive as to respond to any of them via the device. Users, however, can select from a number of third-party apps to receive messages from, including the standard emails, SMSes, Facebook, WhatsApp, Snapchat and most other popular apps. This is pretty basic stuff for a smartwatch though. One of the more advanced features I wished was available in South Africa was the contactless payments using the Ionic. However, I was unable to test this due to the restrictions or lack of support on our shores. 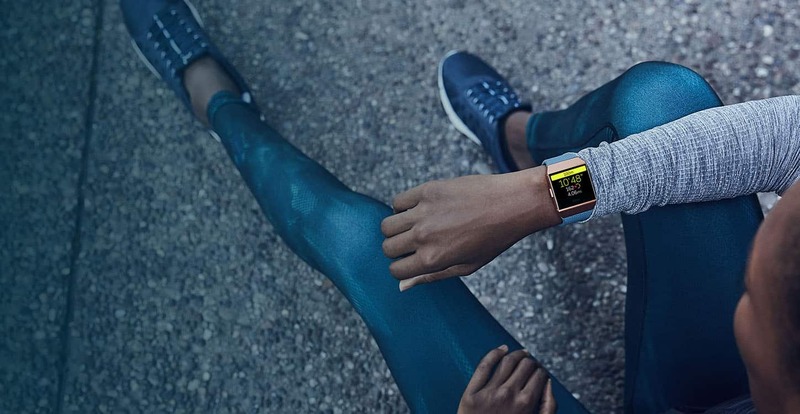 I find the fact that Fitbit aims to make strides towards moving into the smartwatch space, while other OEMs like Samsung and Apple are trying to create a better fitness tracker for their smartwatches. As a fitness tracker, the Fitbit Ionic is one of the best there is available currently. As a smartwatch, however, with the lack of third-party apps currently available, the device does fall quite short of the mark. That said, there are numerous features to enjoy and make good use of during any of your activities. In addition, the future support of the SpO2 sensor makes for good possibilities in sleep tracking going forward and something to take note of. There’s no doubt there’s a lot of potential to be unlocked with the Ionic’s Fitbit OS software, promising to do a lot more going forward into 2018. The company also acquired the intellectual property for Pebble, one of the earliest smartwatches released in 2012. It’s clear that Fitbit is attempting to build on this smartwatch technology going forward. At a retail cost of R5,499, the Fitbit Ionic is priced very similarly to the Apple Watch 3 and Samsung Gear 3 units, with older models now available for much less. This is quite a challenge for the brand as I can only imagine most buyers would be leaning more towards the Apple Watch. Still, the Ionic is a great fitness tracker, leaps ahead of most other competitors.